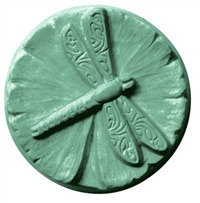 "Nice bars for Samples/Travel/or Guest Bars"
COMMENTS: Jim makes soap on a rope and he is fixated on the dragonfly so we chose this bar to make samples to send out with each order. We just poured it shallow so we got a full 1 oz sample and our customers seem to like them. We also will be using these to create guest bars sets. Jim did say that they were a little difficult to get out on some soap bases. • Nice size to actually use. COMMENTS: Makes lovely guest soaps. 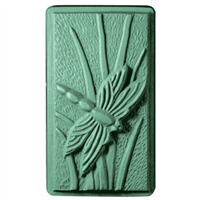 COMMENTS: I love this mold for guest soaps; the only thing is, sometimes it difficult to remove the soap afterwards. I'm sure a little spray of non-stick spray will work. COMMENTS: This mold is one large cavity with 16 square dragonly designs, so you can slice up your soap into 16 little bars. I've used it twice now and been very impressed with both it's sturdy structure and the detail of the designs. Would recommend.